On 24 April 2018, ALDA, in partnership with 5 other European organisations, hosted the final conference of the project YouthMetre. 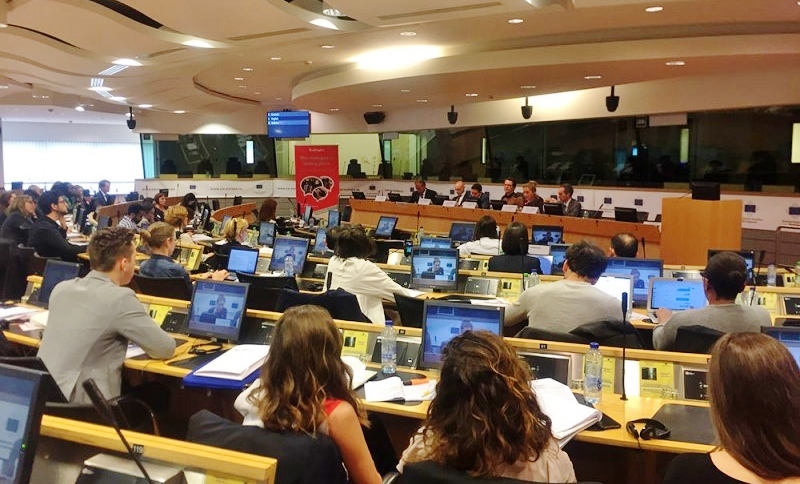 The final conference took place at the Committee of the Regions (Brussels), and gathered together representatives from more than 60 European institutions, local and regional authorities, civil society associations, experts and ordinary citizens to exchange knowledge, experiences and good practices on how to use digital tools to foster youth engagement in policy-making. The event opened with welcome speeches from Ms. Yoomi Renström, Member of the Committee of the Regions; Ms. Antonella Valmorbida, Secretary General of ALDA and Karl Donert, Project Coordinator of the YouthMetre project and President of EUROGEO (European Association of Geographers). The first panel invited a wide representation of institutional stakeholders from all EU institutions and local organisations to share their perspectives on youth active participation in democratic life: Mr. Casba Borboly, Member of the Committee of the Regions; Mr. Emilian Pavel, Member of the European Parliament; Mr. Alessandro Senesi, Deputy Head of Unit at DG EAC; Mr. Davide Capecchi, Research and Policy Officer at the Partnership between the European Commission and the Council of Europe in the field of youth; Ms. Stéphanie Nowakowski, Project Officer at the Bureau International Jeunesse and Mr. Wout Van Caimere, Coordinator of the Youth Intergroup of the European Parliament. The conference was the concluding event of the Forward-looking project “YouthMetre: a tool for forward looking youth participation”, co-funded by the Erasmus+ programme, under its KA3 programme. The initiative aimed at supporting EU Member States, municipalities and regions in carrying out effective policy reforms in the field of Youth, in line with the indications provided by the EU Youth Strategy and according to the priorities perceived by its target population: young Europeans. The YouthMetre project was able to show how it reached the objectives it had set for itself. The project had launched the YouthMetre e-tool in February 2017 where data on youth policy was made openly and easily accessible and where examples of good practices were presented to inspire young people. The YouthMetre data dashboard was introduced to both young people and decision-makers alike to foster ground for dialogue through the use of data. Written by ALDA on 02/05/2018.